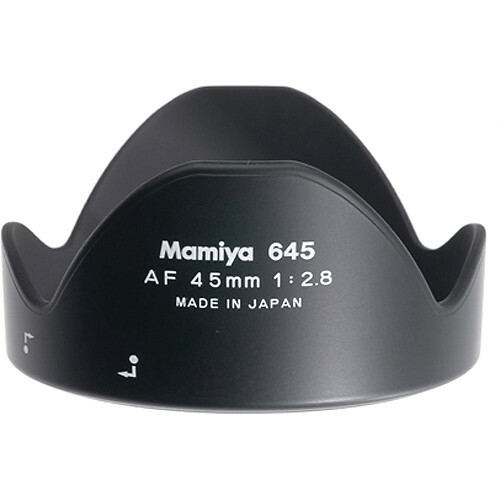 The Lens Hood for 45mm f/2.8 AF Lens by Mamiya is an essential accessory when shooting in strong light and a good thing to have the rest of the time. Lens hoods eliminate stray light that may enter the lens when shooting toward a light source and they offer protection for your lenses from accidental bumps. The 45mm Mamiya hood is designed for the Mamiya Sekor AF 45mm f/2.8 lens. It is made of hard, black plastic and has a petal-shape design. This hood is a spare or a replacement for the one that is included with the lens.